Bulgarian town; 22 miles south of Sofia, and on the left bank of the Jerma. In tracing the origin of its population by the names of the families at present found there, one discovers French, Spanish, Arabian, Hungarian, and other elements. 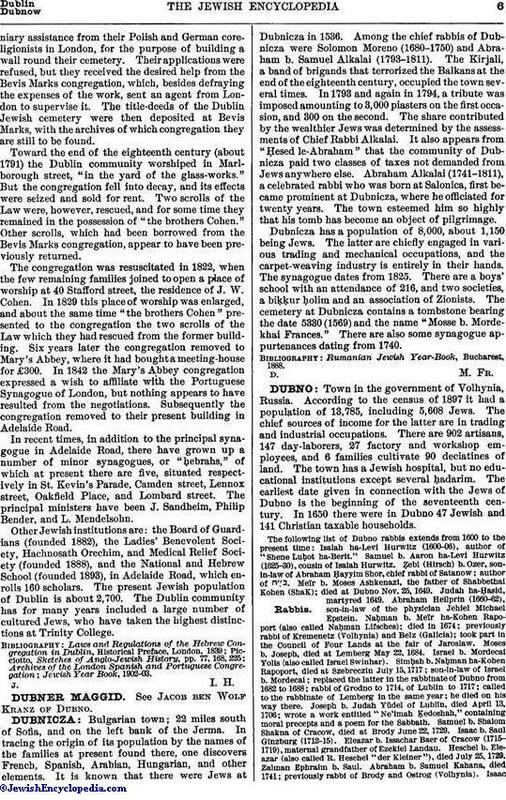 It is known that there were Jews at Dubnicza in 1536. Among the chief rabbis of Dubnicza were Solomon Moreno (1680-1750) and Abraham b. Samuel Alkalai (1793-1811). The Kirjali, a band of brigands that terrorized the Balkans at the end of the eighteenth century, occupied the town several times. In 1793 and again in 1794, a tribute was imposed amounting to 3,000 piasters on the first occasion, and 300 on the second. The share contributed by the wealthier Jews was determined by the assessments of Chief Rabbi Alkalai. It also appears from "Ḥesed le-Abraham" that the community of Dubnicza paid two classes of taxes not demanded from Jews anywhere else. Abraham Alkalai (1741-1811), a celebrated rabbi who was born at Salonica, first became prominent at Dubnicza, where he officiated for twenty years. The town esteemed him so highly that his tomb has become an object of pilgrimage. Dubnicza has a population of 8,000, about 1,150 being Jews. The latter are chiefly engaged in various trading and mechanical occupations, and the carpet-weaving industry is entirely in their hands. The synagogue dates from 1825. There are a boys' school with an attendance of 216, and two societies, a biḳḳur ḥolim and an association of Zionists. The cemetery at Dubnicza contains a tombstone bearing the date 5330 (1569) and the name "Mosse b. Mordekhai Frances." There are also some synagogue appurtenances dating from 1740. Rumanian Jewish Year-Book, Bucharest, 1888.